The American Academy of Pediatric Dentistry, American Academy of Pediatrics, and American Dental Associations recommends children visit a dentist by their first birthday. Our office is strong believer in this recommendation and has seen the advantages to having children seen at this age. Early visits give us time to identify and reduce any risk factors we may find that could lead to unhealthy teeth. 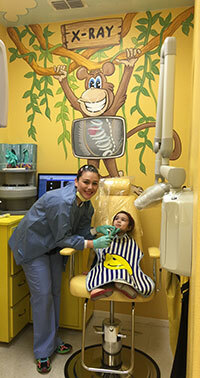 During this visit, we provide you, the parent, with the information needed to care of your child's smile. You can prevent costly dental work in the future by knowing what to do with your child's diet and hygiene as well as your own. 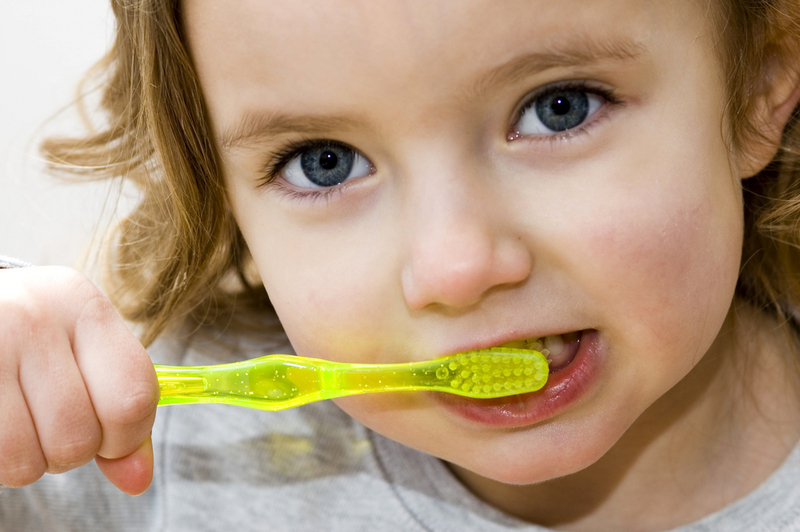 Your child will also be provided with a toothbrush cleaning and a fluoride treatment. A prophylaxis cleaning (i.e. dental cleaning) can be performed using toothbrush, rubber cup, flossing, and/or mechanical instruments. The pediatric dentist will determine the most appropriate type of prophylaxis for each patient. 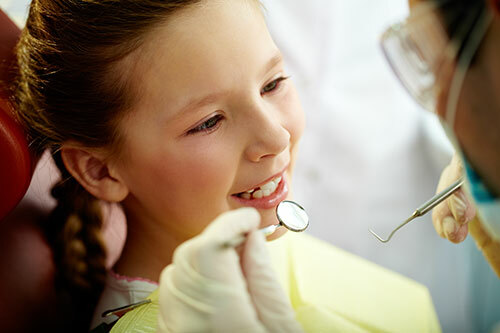 During the prophylaxis cleaning, the pediatric dentist will instruct the caregiver and child or adolescent in proper oral hygiene techniques; remove microbial plaque and calculus; polish hard surfaces to minimize the accumulation and retention of plaque which will result in an introduction of dental procedures to the young child and apprehensive patient. An individualized prevention plan will be established for proper oral hygiene methods, techniques, and removing plaque, stain, calculus, and the factors that influence their build-up. Fluoride occurs naturally in water and in many different foods, as well as in dental products such as toothpaste, mouth rinses, gels, varnish and supplements. When the compound fluoride is used in small amounts on a routine basis, it helps to prevent tooth decay and encourages "remineralization," a strengthening of weakened areas on the teeth. Fluoride also affects bacteria that cause cavities; discouraging acid attacks that break down the tooth. Risk for decay is reduced even more when fluoride is combined with a healthy diet and good oral hygiene. 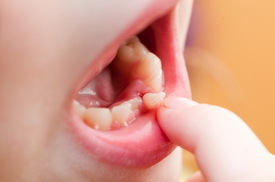 A baby tooth usually stays in place until a permanent tooth underneath develops and pushes it out and takes its place. Unfortunately, some children lose a baby tooth too soon due to various reasons such as accidentally knocked out or removed because of dental disease. When a tooth is lost too early, your pediatric dentist may recommend a space maintainer to prevent future space loss and dental problems. 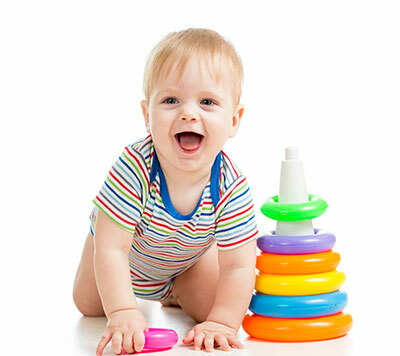 Space maintainers are appliances made of metal or plastic which is custom to fit your child's mouth. They are small and discreet in appearance. Most children easily adjust to them after the first few days. A Space maintainer is more affordable, and easier on your child, to keep teeth in normal positions with a space maintainer than to move them back in place with orthodontic treatment. At times, the decay of the tooth has become so involved to the nerve of the tooth that an infection has developed. This can be of a serious concern due to the fact that it can do damage to the permanent tooth. At times, infected teeth can cause severe infections of the face, head, and neck. In order to resolve the infection and the best prognosis warrannted; therefore, it is important to restore baby teeth as soon as decay is first detected. Very young children and some special needs patients are not able to understand why they need dental treatment. Partial or complete stabilization of the patient is used to protect them from harming themselves as well as to protect the safety of the practitioner, staff, and parent while providing dental care. The dentist, staff, or parent can perform protective stabilization. We only use restraints when absolutely necessary and with parent's permission. General anesthesia is a controlled state of unconsciousness that eliminates awareness, movement and discomfort during dental treatment. This is conducted on an outpatient basis at a surgery center which is a facility that has the appropriate staff and physicians who are trained to monitor your child and manage complications. Precautions are taken to protect your child during general anesthesia for their dental care. This would be the same as if he/she was having their tonsils removed, ear tubes, or hernia repaired. This type of behavioral management is recommended for apprehensive children, very young children, and children with special needs who are in need of extensive dental treatment. While the assumed risks are greater than that of other treatment options, if this is suggested for your child, the benefits of treatment this way have been deemed to outweigh the risks. Most pediatric medical literature places the risk of a serious reaction in the range of 1 in 25,000 to 1 in 200,000, far better than the assumed risk of even driving a car daily. The inherent risks if this is not chosen are multiple appointments, potential for physical restraint to complete treatment and possible emotional and/or physical injury to your child in order to complete their dental treatment. The risks of NO treatment include tooth pain, infection, swelling, the spread of new decay, damage to their developing adult teeth and possible life threatening hospitalization from a dental infection. Your pediatric dentist will discuss the benefits and risks of general anesthesia and why it is recommended for your child.